NUHW members St. Joseph Hospital Eureka joined with nurses on January 24 to protest additional layoffs at the highly-profitable hospital just three months after 25 caregivers lost their jobs. The hospital laid off two radiology technician assistants, which will hinder the department’s efficiency, Kyle Glenzer, a technician, told the Eureka Times Standard. When it comes to staff scheduling, Glenzer told the paper that there aren’t any backups if he gets sick. In the past, he’s had to come to work when he’s sick, he said, so that he didn’t leave his fellow employees in a crisis. 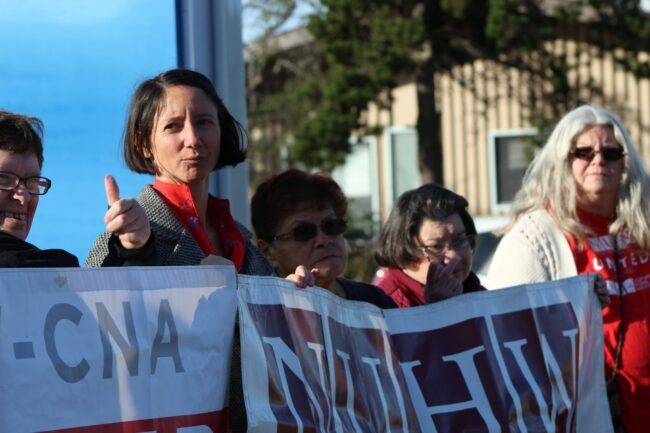 NUHW members and RNs held a series of protests in October when the hospital laid off 25 caregivers, including everyone who was trained to sit with patients who were seen as potential threats to themselves. Their concerns were affirmed in December when the California Department of Public Health cited St. Joseph Eureka for quickly resorting to using bedside restraints on patients, many of whom suffer from mental illness, rather than employing less-restrictive methods, such as bedside caregivers. Carla Thompson, a technician, told the Times-Standard that the latest layoff will further reduce already unacceptable staffing levels. “It was at a minimum, just so much that everyone was able to complete (their) shifts and make sure incorrect (exam) orders were corrected in time without a delay,” she said.